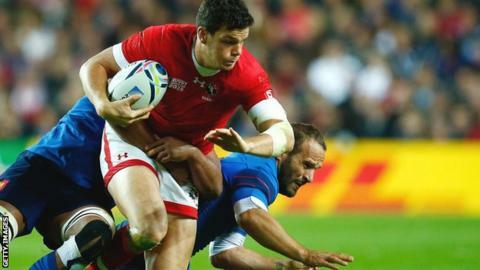 London Irish have announced the signing of Canada international Ciaran Hearn for the remainder of the season. The centre was ever-present during the World Cup and was named in the Tier Two team of the tournament. Hearn, 29, has been capped 49 times by Canada and has featured in two World Cups for his country. He will join fellow Canada international Jebb Sinclair at London Irish, who have lost all three of their Premiership matches in 2015-16. Exiles captain George Skivington was proud of his side's display against Premiership champions Saracens on Saturday. Irish led at half-time before losing 24-14 at Allianz Park. Winger Aseli Tokoirotuma and back row Leo Halavatau scored tries in either half for Tom Coventry's side. "I'm proud of the boys, they did what was asked of them and got on with it," Skivington told BBC Radio Berkshire. The team's tough start to the season continues as they face last season's runners-up Bath at the Madejski Stadium on Saturday. But they led a Premiership game for the first time this season at Saracens and second row Skivington believes they are beginning to click. "We're not a team of superstars, we just grit our teeth and get on with it," he added. "We've got a little bit to learn and we've got to fine-tune a few bits and pieces before we can get that first win. "At Exeter (where London Irish lost 38-11), we were upset with our physicality and that's not what we're about. "Bath play a different game to Saracens, but we'll look to bring some of that physicality that we showed against them. We'll have to get our tactics right if we're going to get over the line."